What if the world changed suddenly? What if one of the laws of science that has always existed, suddenly stopped existing, or the details of the rules changed? For example what if we woke up one day and gravity as we know it had changed, the pull of the earth would still be strong enough to walk on for us, but some lighter animals such as mice, would struggle. It would be easier to walk but harder to wash the dishes. We would be in big trouble, but it might also be a very interesting world to imagine. I want you to alter or stop one of the rules of our earth that we count on. The details are up to you and your imagination. This poem can be very lyrical or very narrative, or anything in between. Congratulations First Half Marathoners! I am so happy that you have completed 12 poems in 12 hours! That is wonderful. Thank you for joining us in this madness. Only use the below certificate if you completed The Half Marathon. Congratulations again on your completion of The Half Marathon. The link below will take to a version of the certificate that is easy to edit. The below image is not as easy to edit and just serves as an example of what the certificate will look like! 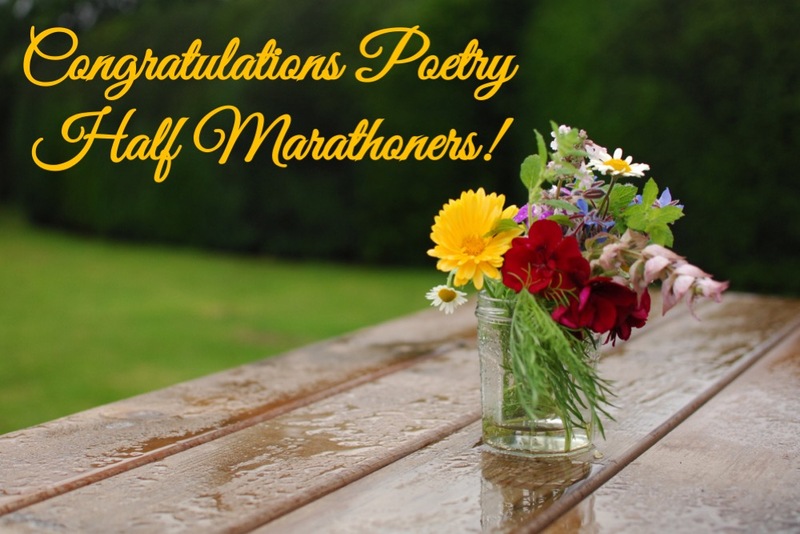 Half Marathoners, this is your last prompt! Congratulations. Full marathoners, after this you are halfway there!!! For this prompt you should listen to The Swallowtail Jig. You can watch the video or not. Personally I prefer to turn the light on my screen down all the way and just listen. But I want you to really focus on the music and do nothing else the first time through. Then you can either turn the music off or play it again. At that point you should start writing your poem. Write a poem where color plays an important role. How you choose to interpret that role is up to you. Write a poem about a spider. This poem should not rhyme. The prompt for hour eight is to write a golden shovel. Not familiar with the form? That is not surprising, it was created in 2010 by the poet Terrance Hayes in his poem The Golden Shovel. It is pretty simple though. First you take a line or lines from a poem you admire. Use each word from the line(s) as the end word of each of the lines in your poem. So for example if you used a line with ten words, your poem should be ten lines long. Keep those words in order. Give credit to the original poet. valley, I shook my head and pointed at the clocks. pool, anything. For the person to be you, on the other side of the ringing telephone. Set a timer for one minute and write a stanza. Stop the timer. Clear your mind. Set a timer for 90 seconds and write another stanza. Clear your mind. Set a timer for 2 minutes and write another stanza. Go back and edit all the stanzas. You can add extra stanza breaks or add section breaks. After you finish editing you can choose to do another timer session or two, or not.